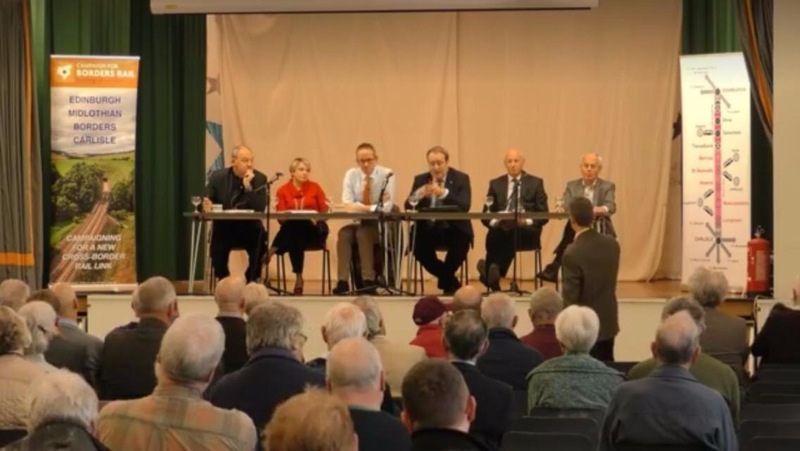 The Campaign for Borders Rail AGM saw lively debate during a “question time” afternoon session, featuring a panel including political rivals John Lamont MP and Paul Wheelhouse MSP. In front of an audience of around two hundred members and guests at Hawick High School (Saturday, 20 October 2018), the Westminster MP and the Holyrood MSP initially argued over their respective track records on support of the Campaign’s cause to extend the Borders Railway through Hawick to Carlisle. However, in the face of intense questioning from the audience, they did reach consensus on the benefits that rail infrastructure would bring to the community. The meeting also heard that the Scottish Government had decided to take forward two rail-based proposals from the recent Borders Transport Corridors Study (the so-called Jacobs Report) – identifying Tweedbank to Carlisle as an option for examination, and also, to look in more detail at a possible link to the East Coast Main Line. Panelist and academic Brian Eaton, who has extensive experience of the value of rail development around the world, cited other examples of sparsely populated areas generating larger than expected traffic flows. His example par excellence was the New Zealand station of National Park, which has virtually no resident population, yet is among the busiest places on the North Island, simply due to the accessibility afforded by rail transport. Shona Haslam, leader of Scottish Borders Council, emphasised the collateral benefits to communities around the Borders, just by having closer proximity to rail services. From the panel on stage, she listened to host Simon Walton who noted initiatives like Kelso Racecourse’s “track to track” shuttle which brings rail-travelling racegoers direct to the venue. “It’s ideas like this that show how rail demonstrably helps nurture and grow business in the Borders,” added Simon Walton. Most closely questioned panelists were Richard Morris, the former chair of the Friends of the Carlisle and Settle Line, who recounted how that line, regarded as a sister business case for the ambitions of the Campaign for Borders Rail, had helped support enterprise in the rural economy, and greatly raise the profile and attraction of the region to a worldwide market. However, the most interest was reserved for John Stevenson, the Carlisle MP, and ‘champion’ of the Borderlands Growth Initiative, who reiterated his support for funding of a full feasibility study, as the very next stop on the line to reinstating the badly needed link through the Borders to Carlisle. For more information contact Simon Walton below.